Many people like to attempt to fix their plumbing problems themselves. Home DIY Plumbing! This is great as it can save you a heap of money. However, you must ensure that you know what you are doing. Read the article below for some tips. Place a pan under your water heater to check for leaks and regularly check the water temperature and pressure. Remove your shower-head and clean the pieces in vinegar. Make sure you remember the order of the pieces to put it back correctly. Ensure that your pipes are not worn out. View your water heater burner, the flame should always appear blue with yellow tips. 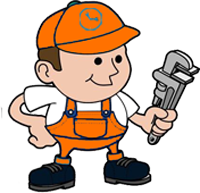 Not sure if you need a Melbourne Plumber – Play it safe and call one. When you must replace, repair, or unblock any drains. This requires special training and the right equipment. Most store-bought augers (drain snakes) are short and cannot efficiently unclog a drain, and if not used properly they can also damage the pipes in the drain. Using chemicals such as Draino or other products is OK for very simple clogs, but anything that requires more than a couple of applications is a job for a Melbourne plumber. Any problems involving the water main line. Melbourne Plumber have the required equipment to shut off the water from the main line. Any remodeling work that requires pipes to be installed, replaced or repaired requires the services of a Melbourne Plumber. Anything that has to do with pressure balance issues and installation of new pressure valves requires the services of a Melbourne Plumber. Any project involving electrical wiring, hot water, and rewiring and installation of new hot water systems requires the services of a Melbourne Plumber. Plumber Prahran, Plumber South Yarra, Plumber Toorak, Plumber Carlton, Plumber Brunswick, Plumber Brighton, Plumber Camberwell, Plumber St Kilda, Plumber Malvern, Plumber Elwood, Plumber Caulfield, Plumber Cranbourne, Plumber Doncaster, Plumber Frankston, Plumber Williams Town, Plumber Port Melbourne, Plumber Carrum Downs, Plumber Glen Iris, Plumber Hampton, Plumber Mordialloc, Plumber Box Hill, Plumber Middle Park, Plumber Richmond, Plumber Burwood, Plumber South Melbourne, Plumber Hampton, Plumber Albert Park, Plumber Elsternwick, Plumber Ivanhoe, Plumber Templestowe, Plumber Essendon, Plumber Pascoe Vale, Plumber Thornbury, Plumber Coburg Plumber Rye, Plumber Portsea, Plumber Sorrento, Plumber Rosebud, Plumber Mornington, Plumber Dromana, Plumber Mount Eliza, plumber Kew, Plumber Chelsea, Plumber CBD, plumber Carnegie, plumber Cheltenham, Plumber Bon Beach, Plumber Mentone, Plumber Seaford, Plumber Carrum, Plumber Safety Beach, Plumber Karingal, Plumber Langwarrin, Plumber Skye, Plumber Sandhurst, Plumber Balnarring Plumber Mount Martha, Plumber Pearcedale, Plumber Baxter, Plumber Clyde, Plumber Clyde North, Plumber Lynbrook, Plumber Lyndhurst, Plumber Fitzroy, Plumber Armadale, Plumber Hawthorn, Plumber Caulfield East, Plumber Caulfield South, Plumber Caulfield North, Plumber Officer, Plumber Hampton Park, Plumber Beaconsfield, Plumber Berwick, Plumber Narre Warren, Plumber Hallam, Plumber Endeavour Hills, Plumber Yallambie, Plumber Westmeadows, Plumber West Melbourne, Plumber Watsonia, Plumber Viewbank, Plumber Tullamarine, Plumber Southbank, Plumber Rosanna, Plumber Ripponlea, Plumber Reservoir, Plumber Princes Hill, Plumber Preston, Plumber Northcote, Plumber North Melbourne, Plumber Montmorency, Plumber Meadow Heights, Plumber Macleod, Plumber Lower Plenty, Plumber Kingsbury, Plumber Kensington, Plumber Wheelers Hill, Plumber Waterways, Plumber Travancore, Plumber Surrey Hills, Plumber Strathmore, Plumber Springvale, Plumber Sandringham, Plumber Patterson Lakes, Plumber Oakleigh, Plumber Oak Park, Plumber Notting Hill, Plumber Noble Park, Plumber Niddrie, Plumber Murrumbeena, Plumber Moorabbin, Plumber Moonee Vale, Plumber Moonee Ponds, Plumber Mont Albert, Plumber McKinnon, Plumber Keilor, Plumber Jolimont, Plumber Jacana, Plumber Highett, Plumber Heidelberg, Plumber Heatherton, Plumber Abbotsford, Plumber Aberfeldie, Plumber Airport West, Plumber Alphington, Plumber Ascot Vale and all over Melbourne.